Two things I got done this weekend after getting back from vacation. 1st thing: I bought bulk amounts of chicken and pork. I’m stocked up with hamburger currently so I didn’t need anymore. 2nd thing: I cleaned out my freezer and made an inventory of what was in the freezer. 3rd thing: I made some ready to go into the oven/grill/skillet meals. Since I did these things, meal planning was easy. My meal plan has only the main dish. I will determine the side dishes and veggies during the month depending on what I have in the house. Last week, I cleaned out my corner appliance cabinet. It’s in this weird shape that makes it a good place to store appliances. While cleaning it out, I pulled out my food processor and have been using it more faithfully. 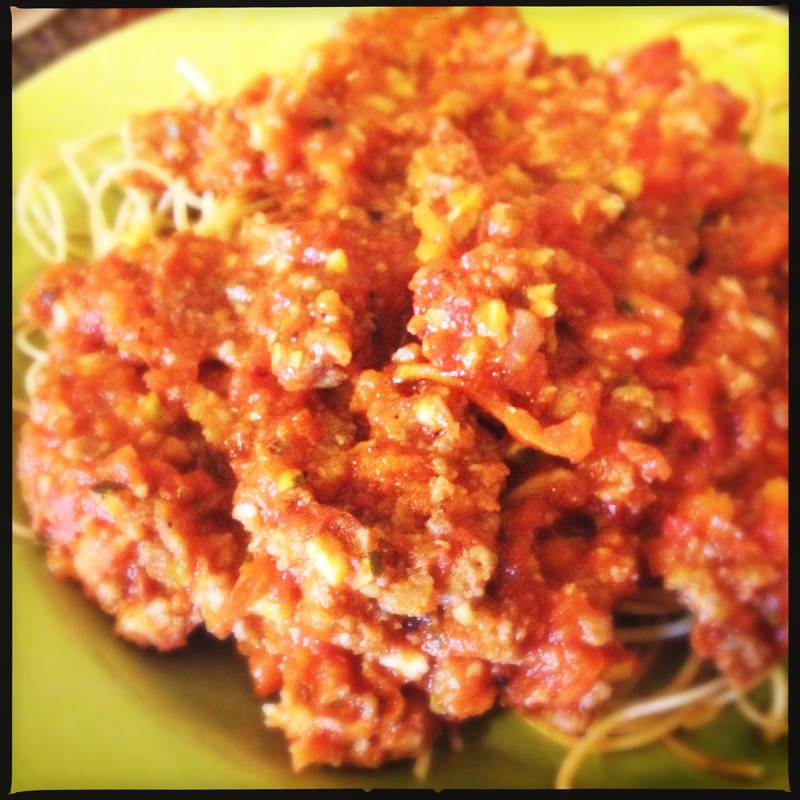 Today I decided to make spaghetti for supper, a family favorite. I made a sauce of fire roasted tomatoes, zucchini, carrots, onions, and sausage and then served it over whole wheat pasta. Hubby gave it two thumbs up and then went back for seconds. The Imaginative One doesn’t like sauce so he didn’t want to try it. Brown the sausage and then drain it. Place the shredded carrots into a saucepan. Place tomatoes, zucchini, and onion in the food processor and dice them up into small pieces. Place the mixture in the sauce pan. After the sausage is done browning, place it in the saucepan with the carrots and tomato mixture. Season with Italian seasoning. Mix together. Serve the sauce with the pasta. A few weeks ago, I was introduced to this wonderful blog called Plain Chicken. I found many recipes I want to try. Many of them look delicious. 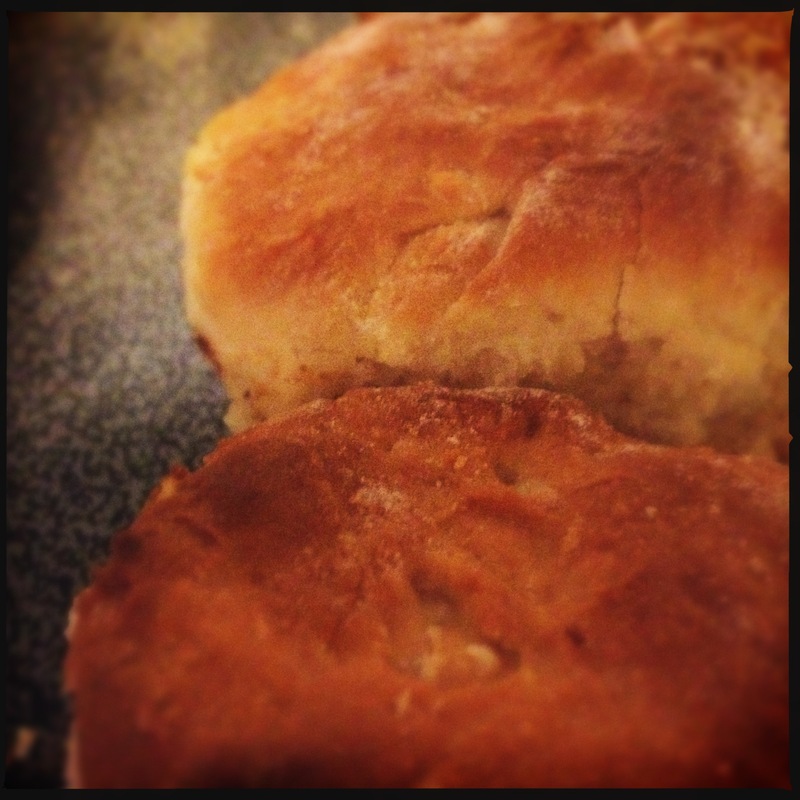 One of the recipes was for 7-up biscuits. I’m always on a search for biscuit or roll recipes. We enjoy having bread with our dinner not daily but a few times during the week. Hubby and I loved them. Then I took some over to my mother-in-laws to share with her. Both my father-in-law and her gave their seal of approval. I love the ease of the recipe and that it calls for only four ingredients! They remind me of Popeyes’ biscuits. Cut sour cream into biscuit mix, add 7-up. The dough is very soft and will get all on your hands. This week is going to be a little different. Two years ago, the Imaginative One wanted to attend as many Vacation Bible Schools as he could. This year the Wee One wants to do the same thing. We are limiting the number though because of other obligations. They attended 2 a couple of weeks ago and are attending one this week. It is in the evening which is great because they have swim lessons in the mornings. Anyho, they are providing dinner for the kids on the four nights they are attending the Vacation Bible School. This makes my menu planning interesting. I’m only cooking 2 times during those four night and my hubby and I are going to eat the left overs on the other 2 days. Then on Saturday, we are spending time with family for a birthday party. I don’t know what we are going to do for supper on that night. It’s going to be probably eating out or something out of the freezer. We may go out with my mother. Hubby is probably going to be on his own. The Imaginative One is very laid back. Hakuna Matata could almost be his theme song. He’s been like that since he was in utero. The boys are allowed to pick what they want to do for their birthday. The Wee One had a list a mile long of things he wanted to do for his birthday. He also had a list a mile long of what he wanted for presents. Okay maybe not that long but he knew what he wanted. The Imaginative One is the exact opposite. He doesn’t know what he want to do for his birthday and people are having a hard time figuring out what to get him for his birthday. Last month, I found a recipe for these S’Mores Bar and decided to try them out. The Imaginative One loved them so much that he decided that he wanted these instead of a cake or cupcakes for his birthday. Yeah! He made a decision. Since my sister-in-law, brother-in-law, niece, and nephew were in town, we decided to celebrate his birthday four days early. We ate a delicious brunch and then sang to him. Everyone enjoyed these bars. 6 Hershey bars broken up into pieces or 1 c. milk chocolate chips. Cream together the butter and sugar until well mixed and yellow. Add flour, baking powder, salt, and ground up graham crackers. Mix until incorporated. Grease a 9 by 13 baking pan. Press the dough into the pan evenly. While the crust is baking, get the topping ingredients ready. When you take the crust out of the oven, turn the oven up to 450 degrees. After the crust is finished baking, spread the marshmallow fluff over the warm crust using a greased spoon or spatula. 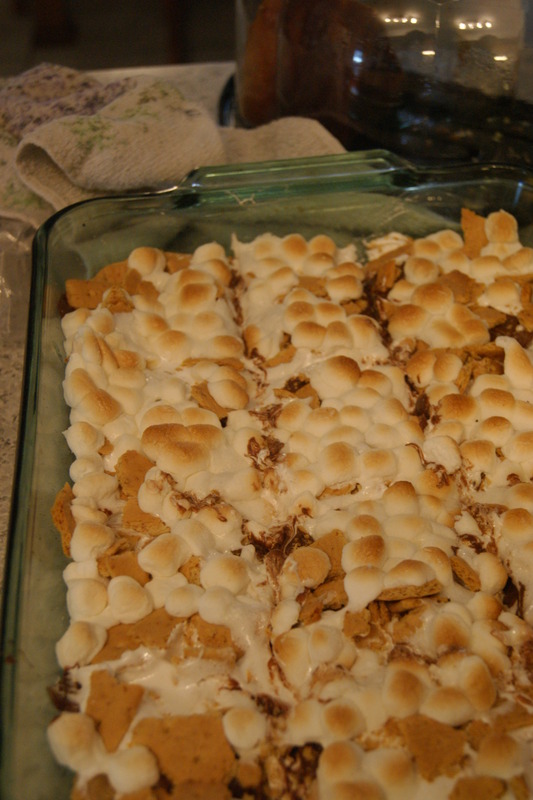 Sprinkle the top with first the chocolate, then the graham crack pieces, and then the marshmallows. While it’s still warm, cut it into pieces.